the Ride at Disney’s Animal Kingdom is an intense journey back in time to the meteor shower that made Dinosaurs extinct. Your mission: Rescue and bring back an Iguanodon before the meteor shower makes you extinct as well!! This post contains affiliate links, which means I receive a small commission if you make a purchase using these links. It is no additional cost to you and I only recommend products & deals that will help you get the most out of your Disney experience. Dinosaur the Ride- Things No One Tells You! , a main character from the movie, is there to greet you at the main entrance to the ride! FastPass is available, but if you ride early in the morning you won’t need it. 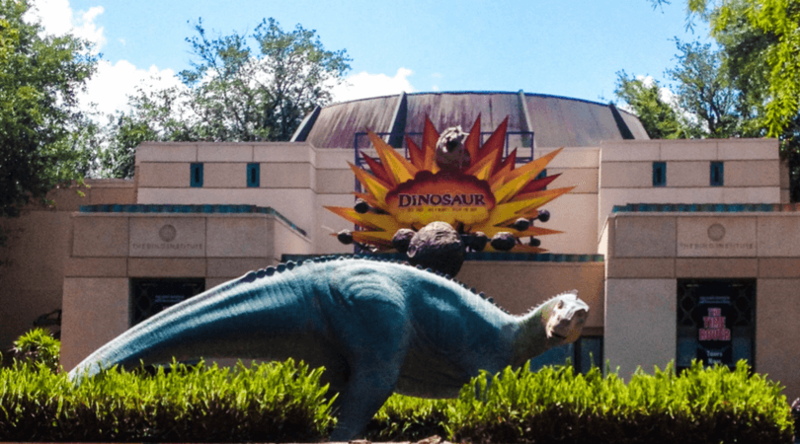 Most people head straight to Kilimanjaro Safaris in the morning…if you head to Dinosaur the Ride before 10 am you are pretty much guaranteed to walk right on! If you choose to head straight to Kilimanjaro Safari(which isn’t a bad idea) in the a.m., then schedule your FastPass after lunchtime. Tip: Head to Flame Tree Barbecue right after for an awesome quick service meal with a great view of Everest!! • The Queue is Awesome! to view and another T-Rex fossil is displayed in the main waiting area (along with air condition!) pictured below. There is also a really cool souvenir shop as you exit the ride. and a few of the other souvenirs/park gear that I brought home with me! The Time Rover you climb aboard for your trip back to the Cretaceous period holds 12 people. Three rows…four seats per row. Each seat is padded and has a lap belt restraint. I suggest pulling your lap belt out a good bit before locking it in… as it can pull pretty tight on the twists, turns, and drops during the ride. I would suggest it more for the older kids. It’s a bit scarier than they give it credit for…hence my moms face in this pic!! I bust out laughing every time I see our reactions in our Dinosaur the Ride Memory Maker pictures! My mom is in the front row far left… and I’m the one beside her looking in awe at the huge Carnotaurus that has popped out to scare the bejeebers out of us!! Great ride and definitely in my top 5 Favorite Attractions at Disney’s Animal Kingdom!! Lots of facts I didn’t know about Dinosaur! 🙂 I hope it was very informative!! This is one of my favorite rides! My mom refuses to open her eyes on it haha. 😆 I bet the ride picture of that was awesome!! I can’t wait to go to DisneyLand!! Thank you or giving me the opportunity to Link Up with your blog!! Stay in touch! Do you like this one better than Expedition Everest?? Dinosaur was one of my favorites as a kid and still is. Now that I think about it I haven’t seen the movie in a LONG time. I can’t say on that one…I haven’t had the opportunity to ride Everest but it’s on my must ride list for December!! I can’t wait to go back and try the new Soarin and Frozen rides. Same here!! I’ll be in Orlando December 11-17!! I checked out your blog…looks great!! Traveling across country solo?